Great photos. Also, love the styling with the green outlines and contrast between black and white and color. Well done! 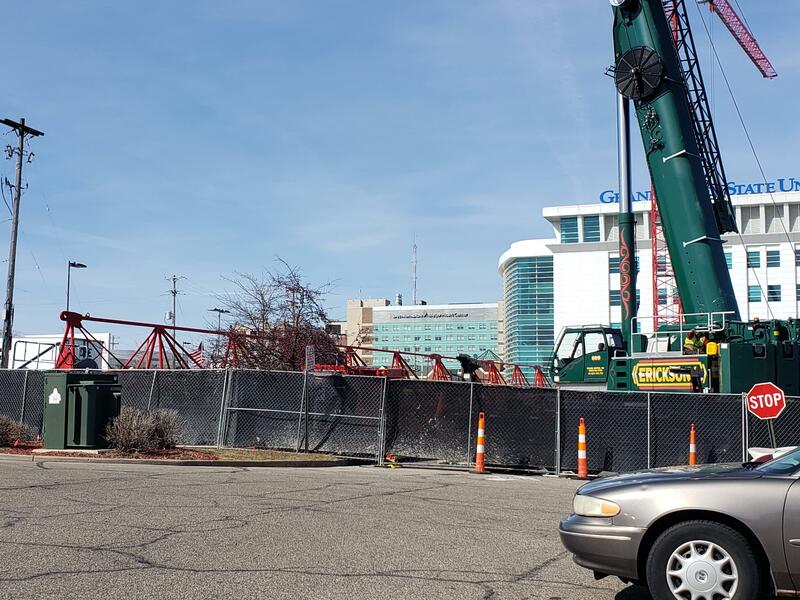 Anyone see the second tower crane base yet? I imagine it will be over to the right someplace. I didn't realize how deep they were digging that parking ramp. That's quite the retaining wall along the highway. The owner/developer of Redstone Group (suburban condos) is proposing to build a 20 unit 2 story apartment building at 1542 Michigan St, behind an existing 12 unit apartment building. One of those complexes that you don't even notice typically. Hmmm I wonder why? Enough complaints from neighbors wanting the woods in their backyards is my guess. Kyle Van Strien, who chairs the planning commission, said he voted against the project because of “secondary” impacts the additional residential units would bring to the area, such as traffic and noise. I really wish this would stop being used as a justification. Traffic is coming in and out onto Michigan. No home is really going to be affected by that. "Noise" is just to vague. If someone is going to be that loud, then just call the landlord or the police. I can understand why the neighbors wouldn't want their backyard woods replaced with an apartment complex. But you can never rely on land you don't own. Ditto; in this case especially it is complete BS. This is a 2 story apartment building directly behind a 2 story apartment building. If this is not the very definition of incremental appropriate use I have no idea what is. It seems like every day I become more convinced that Planning Commissions should be dissolved and the land-use authority of cities revoked. I wonder how much it cost Redstone Group to submit their application that was just rejected? To a development group as large as this it probably does not matter. But to the point that has been made numerous times on this forum, the small scale developer, new developer, or even individual land owner applying for a zoning variance or special land use permit is completely out of reach knowing a project can get shouted down by Neighbors. Not to mention the cost incurred for engineering and architectural drawings. This rejection will hopefully go down as a classic example of NIMBY foolishness. So, what would be appropriate, for this completely empty parcel behind an apartment building o an significant through-way be? Is The City willing to buy the parcel in order to create a park? The City should be obligated to purchase every undeveloped parcel on which they reject development. I think what happens in the suburbs, is people realize that if you don’t own it, it’s ripe for development. If you want to look at woods you don’t own, buy the property, or consider it a luxury that might change. I can’t believe this could get shot down. If it were a traffic or infrastructure issue, maybe. It almost seems, dare I say, criminal- or extremely negligent on the commissions part. Maybe I’m a tad bit spiteful, but if I were the developer I would be half tempted just to clear cut the land and see how the neighbors like looking out over an empty field. LOL some developers have done that before. Problem is if they go back again for another try, the neighbors are really Nimby's. Although in this case I'm not sure they could get much worse. I use to work for Redstone Group. It was my 2nd internship program I took coming out of University. I loved working for them over the summer. Yeah, this can’t be something that is easy for a developer like them. They were a company a size of 30 people, but during the time I worked for them during the tail end of the Great Recession, they were down to 4 people. I’m sure they are doing better now, but I’m very much sympathetic to developers and the things they have to deal with. It’s why I’m not an architect today. I have a huge beef with the Grand Rapids Historic Preservation Committee for ruining what would have been a crown achievement for me in my early adult life, and getting a house I designed during college constructed for habitat for humanity. In today’s age, property rights mean nothing. It’s why I’ll always be a libertarian. Governing Committies think they are out doing the common good, but in reality, the people providing for the community are those who design and build what people live in. Just because you work in a semi-circle doesn’t mean your ideas are enlightened from the gods above. I noticed there's a large green Erickson's crane onsite now (tower crane builder). Wonder if it's staging for the 2nd construction crane? Rair Systems, a medical marijuana facility, is looking to open on Michigan Street near Midtowne Village (where the pizza place is now). The one that I'm interested to see is Skymint - https://www.skymint.com/ - There was an interesting article on Mlive about Green Peak (which will be launching the retail Skymint brand). Looked like the locations have a nice design. Medical Mile meets the Green Mile? Anyway, Rair Systems needs to invest in a architect that isnt sampling the product before using CAD. 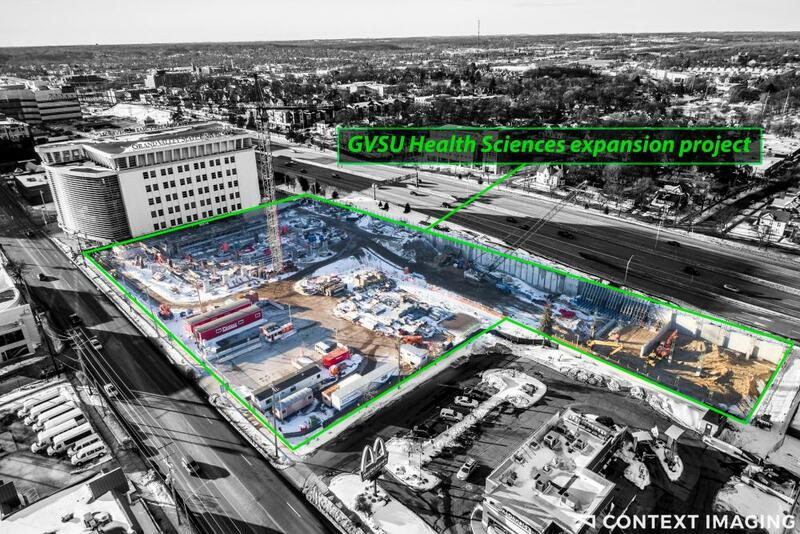 This article is a very nice read on how Van Andel Research Institute touched off the establishment and growth of Medical Mile. Enjoy. Was this posted in the forum somewhere else? I couldn't find it. Seems like a necessary diet to a stretch of road that is heavily traveled. I've always hoped that they would add cycle lanes to Michigan Street, and this seems like the perfect time. I did realize that there is no line painted along most of this stretch of road and most people drive in the middle anyways right now. Michigan Street is all around terrible in that section. Terrible to drive, terrible to look at, etc. I’m slightly skeptical of “road diets” and think we do a pretty mediocre job of making them look nice, but Michigan Street needs some love. I hope it looks good/works well. A pedestrian crosswalk at Grand is needed and will definitely do well to slow down the traffic. The traffic from cars going west on Michigan turning north on College backs up to Union on a regular basis. I wonder what impact a road diet will have on this.